If you are struggling to fix your slice your first port of call should be to check your grip. Mistakes here will cause the club to open at impact, creating a left-to-right ball flight. 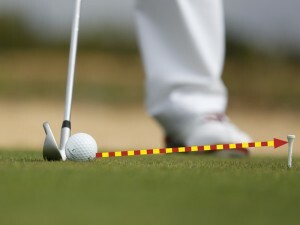 Making significant changes to your grip is never easy but finding a more neutral holf of the club really is imperative. 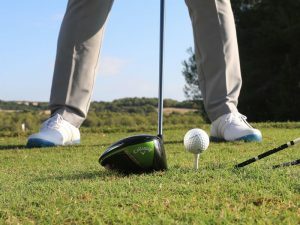 If your hands are set correctly you’ll find a better swing path with more control over the face angle – all of which will really help to fix your slice. I often find the main culprit with the grip itself is the left hand, this prevents you from controlling the clubface through impact. Instead of the knuckles pointing at the target, they are aiming more at the ground. 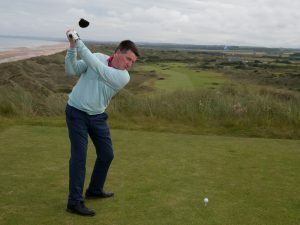 As the left hand controls the clubface you are in danger of hitting a consistent slice from this position. 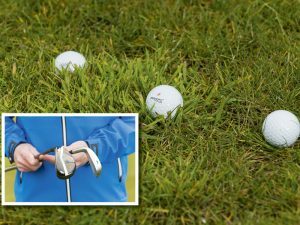 So start by getting your left hand further over (so the back of the hand is facing the target) with your thumb running straight down the club. Then fold your right hand onto the club so the ‘v’ between your right forefinger and thumb is pointing between your chin and right shoulder. 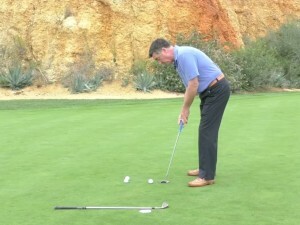 This will feel odd at first but grooving it is the only way to rid yourself of your slice. 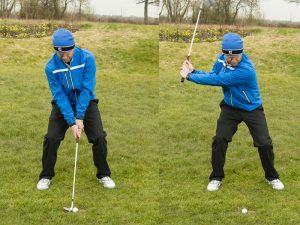 There are some other faults that can occur at address, particularly relating to your stance, but for now I want to move on to a few drills to get you working the golf club on a better path. 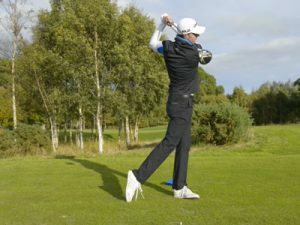 No matter whether you are setting up to the ball open, closed or even square, one thing is almost certain – you’ll be coming ‘over the top’ in the downswing. 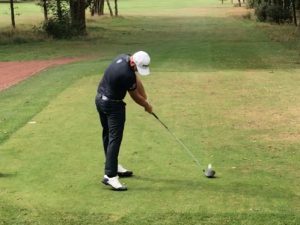 This is often caused when you fail to keep your upper body centred over the ball and it causes you to cut across the ball at impact creating that left-to-right ball flight and is probably the most common reason for a slice. Instead of working out how to resolve the technicalities of this destructive move, this drill is designed to give you a better feel for what to do. 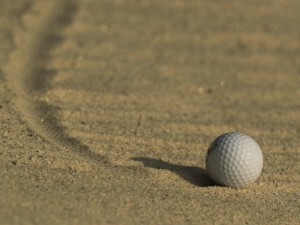 Set two headcovers on the ground either side of the ball as shown to create a gateway. The aim here is simple, strike the ball without taking out either or both of the headcovers. This is a great way to force yourself to change a destructive out-to-in swing path and start attacking the ball from inside the ball-to-target line. Start by swinging the club slowly and then build up the pace as your confidence grows. 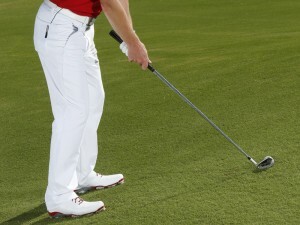 The more balls you hit following this drill, the more likely you are to fix your slice. This is a great way of grooving a better move without having to learn the technicalities of finding an in to out swing path. 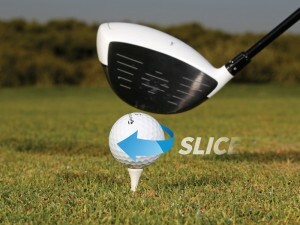 One of the most common causes of the slice is a move known as the reverse pivot. This refers to when your weight moves in the wrong direction during the swing. This often happens as a player looks to help get the ball up in the air, leaning back through impact. Inevitably your weight gets stuck on your left side at the top, there is a lack of body rotation and then on the right through impact. This is often caused as people try to help the ball into the air but the result is you leave the face open, bringing an ugly slice into your game. 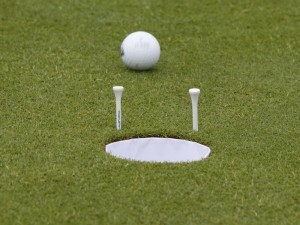 To help fix your slice, imagine you were throwing a ball, your weight would go away from the target as you take your hand back and then towards the target as you release the ball. Have this vision in mind for your swing and as long as you are making an athletic shoulder turn in the backswing, you’ll be in a much better position to return the club square through impact. If you have been struggling with a slice, chances are that you have started to aim a little left at address. This is a natural reaction and you may have started doing this subconsciously. 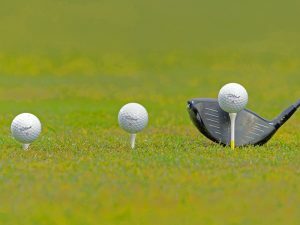 Not only will your swing path be more out-to-in but to ensure you don’t hit the ball left, you’ll have to delay the release of the club through impact – another key cause of a slice. If you are delaying the release of the clubhead, the face will be left open through impact. As you wait to play, make a series of right hand only swings. The weight of the clubhead will help activate the release of the right hand more effectively helping you to square the face more effectively. 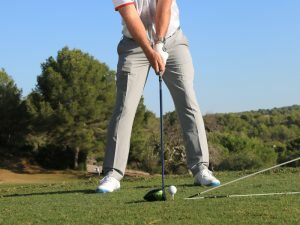 As long as you are aiming square to your target line, this very simple little drill will really help to fix your slice and give you some ideas in how to avoid driving out of bounds. The slice can come without warning and if you’re in the middle of a good round when it does, you’ll need a plan to help resolve the issue. When you get back to the clubhouse at the end, the simple plan shown here, will help you rid yourself of the fault forever.